I spend my life with my eyes behind a lens, my hands in the engine bay of old cars, my feet planted on a surfboard and my head in the clouds. I’m happy you stopped to view my images, stay a while if you please, say hello once in a while. Note: Bee one one oh = B110 = Datsun 1200. My truck is actually a GB120. I had a VB110. Glad you liked the photos. Yep, go ahead. A link to the blog will be sufficient. im loving your blog man…keep up the good work. go the datto!! Hey guys.. This is bryan(works1200) off of datsun1200.com and I just came across your site. Sick!! Very well put together :) I’m currently working on my brothers 71 4 door 510. SR20DE block with an SR20VE head. 20v cam angle sensor and AE111 ITB’s with a custom manifold. All run by a Haltech E6X. Coilovers and 15×7.5 -5 matte black SSR reverse mesh. Should be running in two weeks. Hey Bryan! Long time now hear. Good to see you’re still on the datto ‘Scene’. I will give you an email dude. Great blog by the way. I own two 1200’s (one sedan and one coupe) and have been working on the coupe for a couple of years now. In Canada we don’t have many of them around so its nice to see the car getting some attention. off my blog. Hope that’s ok? Great site! I like it, I’m planning on getting a sunny truck. Great blog – really enjoy it! “The specified image does not exist”?? great blog, im loving the old skool japanese stuff, cant find this anywhere else in English anyway! This may be a bit wierd and FYI, but since you love the b series utes, I know a guy who had an awesome little one. His name is Paul Lecren and he races a TQ midget at western springs. Not too sure if he still has it, but I loved walking to school years ago watching him snake it up the road on his way to work. haha From memory he had lots of spares for them too. Anyways keep up the good work, yours, C’s garage and Ollys blogs are keeping me in touch with the nz car scene from over here in the uk. I’m lovin the new banner. Looks so clean, but still hella nice. Also nice truck. I don’t think we have those in the US. Hey bro cool site.I own a 1982 roadstar and was wondering where you got your front lip from or made? Thats cool, cheers for asking. Hi Cris, i´m from Portugal and i love your blog it´s alredy for me a every day must see. Me and some friends have a small forum about Datsuns and i´m asking if i can use some of your cool photos in the forum, i have many photos of portuguese racing datsuns if you whant somes just lete me now. Hello!! Just Dropping a line and Giving Much Props to a Sik site. I’m From Las Vegas,Nevada. Starting to do some research on the B110 coupe. Thanks.! Hey man I’ve been following your blog for a while and it’s just great. You actually inspired me to start try some blogging and start up my own blog about my 1981 B310 restoration. Hey, I wanted to ask you a quick question about the pair of Mk2 you just sold. They were 13×9 -20 so were those A Type dish? I’m wanting to bid on a set of wheels and they are the same specs but do not have the offset listed. I assume A type is -20 but I just figured you knew for sure.. Thanks! Haha I sure was man! I’ve always loved the look of tiny wheels and was between 14″ and 13″ for my 86. Your pair made my mind up. Anyways, thanks for the info! HI, first, I just wanna to let you know that i’m following your website since a lot of time and I really appreciates it; beautiful picture, posts and comments ! Continue like this. Secondly, i’m starting in the creation of a blog and I wanna know what is your wordpress theme ? If you do not want to share it, it’s ok .
Hi there, Love the site! full of JDM goodness! I was wondering f you had any side on pics odyour 1200 with your 13×7 performance superlites fitted? I’d love to see it, thinking about getting a set for mine. What’s the A15 like? I just got a completely stock 71′ B110 coupe. I have no idea what to expect out of the stock A12? I think that’s what’s in it. Cool man, you do some solid restoration work. It’s good to see. beeoneoneoh…. Amazed, Supurb Blog to say the least. I came across it recently and spent a few hours flipping through all the past entries. “Blown away”… The 110 is looking great and now being SR powered has to be quite the fun machine. Would love to see some new photos of the sunny, no doubt the 110 would walk my 521 hands down! Killer 7D as well, Im kickin’ coins together to stepout of my Xti and into one. Stay cool and keep it real bro. Hey Chris, im currently building a coilover set-up on 120y struts for my b110 sedan. I read on the thread that the golf/rabbit inserts are different thread size, will that effect much, cos i have Cusco b110 camber tops, or should i just use the Pulsar ones? Im after a very similar look to your truck, and i’ve already got the wheels and stretched tyres to suit! Let me know your opinion cos you have more experience with this than me. Lets see a pic of your sedan Ben. I shortened the strut to fit pulsar ones myself, and then shortened the shock leg also to remove some more length out of it. I wouldn’t go down this option again unless it was going to 100% be a street car and being low was the only real worry. If it were a street car or done on an ultimate budget then I would use the MK1 golf inserts – they are stiffer and 10mm shorter in the body. You would shorten the shock leg anyway so it means you can turn the right thread needed into the shock leg for the camber plates too. I have a 250lb spring in the front but I am wanting to go stiffer, in fact I want to stiffen up the whole suspension setup some more. Previously I had the 120Y swaybar in there which is thicker also but I’m putting the factory one back in, generally you want stiff springs and a smallish swaybar or softish springs with a heavier swaybar, or at least that is what I have been told from track racers and have read it a few times too. It makes good sense though. Like I said before, I myself won’t go down the shortened strut and shortened factory insert route again. Instead I am going to adapt a body adjustable (full tap) coilover setup from something like a FWD honda or the rears of an NA MX5, S2000 or similar. I suggest these because they are super small already, S13 ones are too long for a B110 to actually go low. The lower cups/brackets/sleeve needs to be steel to weld to the factory stub axle however, some are alloy. Doing this means you have an adjustable shock, height adjustment rather than just spring adjustment and a more efficient system that you shouldn’t have to touch again. Do it properly first time. I only plan on going 3″ lower all round to be tuckin’ the 15’s ive got, so I don’t need to take drastic measures to make it ultimate low! Just after that clean look with a fair track-inspired ride, as im planning on using this car in the distant future for racing purposes only. And as you said may aswell do it right the 1st time. Will the Pulsar shocks allow me to get this result? And why did you shorten the shock leg, and what benefit do you get? I am looking at getting the Otomoto coilover sleeve kit and the springs rates are 4-8kg/mm just wondering what springs i would be after? Hey keep up the great work, I check your blog on a daily basis.Japan looks crazy can’t wait to see more pictures from you trip. you got some pretty sweet photos man..! keep it up! I will check you blog every now and then! Hi Christopher, i love the quality of your photos and i would like to know what gear you are using. Great pictures and stories as always. I was curious, which color film do you use, particularly on the latest Japan shots? Your photography is great though. You should get into medium format! Thanks man, yea I have a Rolleiflex 2.8F but I haven’t really posted any of the film I have done with it. I have enough film to last me all of 2011 to be honest but I will have to break it up. Ah sweet. Yeah I just got a bronica 6×6 to shoot medium format with. I love it but am still getting the hang of it. Great fun though! It is awesome to see film being used for such good photography. Sir you certainly have an eye for good images and frankly if I worked in the motor journalism industry I would be asking to purchase your images on a regular basis. Keep up the good work, you make my daily boring job enjoyable eachtime I check the site..
Hey chris i dont know how to send this to you private but i thought id share with you..
On ebay right now and mega cheap i think..
and this datsun on a friends friend facebook pics in a recent trip tp japan..
Hi Chris, you’ve created what has become Hands down my favourite site to check out. Love your film work, spine tingling good. The Photography, the cars. All perfect. Keep it up brother. Ah, those were the days. There was something really special about Jap cars, especially oin the early 70s. 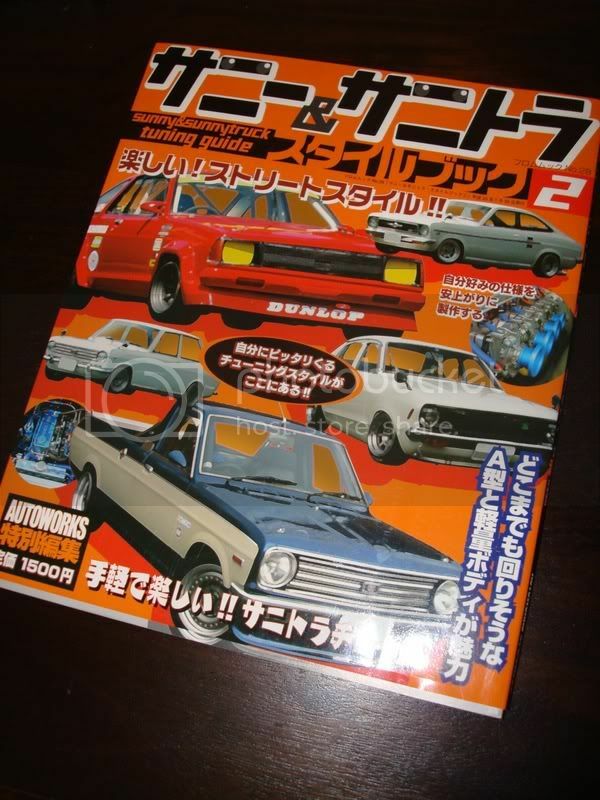 My favourites were Honda N600 (the first car I ever drove), Mazda Rx3, Rx4, Rx7, h u g e Toyota Crowns, little Toyota Starlets (RWD), Hinda Civics, sadly I never had much exposure to Datsuns, but they were great at bringing out new shapes, and models (way ahead of Europeans). We’ve had numerous Japs in the last 30 odd years, but they’re all so European now! I just wanted to say that I think your website is amazing. So much atmosphere in your shots, and the captions you add are great too. Keep up the great work, you officially have another daily watcher for updates. Thanks for the compliments Will and it’s good to know I’m still attracting new viewers. hey what kind of camera do you use? I really would like to get into photography but i would love to learn to use a real film camera! So if you could help me out, please and thank you. great pictures, love them all !! Great pages. Better photo’s! Over the past few days i’ve gone back through ALL of your old posts. Inspiring me greatly. I also have a love for datsuns and photography but i’m no where near as talented as yourself. I recently picked up a KB110 1200 coupe over here in tassie. 100% stock as a rock! Plans are dump it on little 13’s with stretched tyres. Throw some extractors on it, with a single side draft weber and a manual conversion if i can muster up the courage! Looking for that jap spec look that’s going around these days. Ps – How about a post showcasing your collection of wheels? I can imagine you have some kind of gold mine. Cheers man, there is some good stuff in the archives that’s for sure! I think a lot of people who find beeoneoneoh don’t realise the extent of interest in Datsuns haha. If you ever get it low as you say be sure to send through some photos. Hey man, Ive been following your site for sometime now and I just wanted to say you have the best datsun site on the internet, your photography is amazing and thanks for sharing. If there is anywhere in the world where Sunny trucks should be raced it’s South Africa. Good to hear you’re supporting it there! I noticed you watermarked all the images you put up with your own watermark and even some with my address. I can’t help but suggest that it is very bad practice to watermark others photographs, regardless of what they are, without their permission. The photos of Japanese cars I found on my searches through the internet (disregarding my own) and as such I do not watermark them. I provide a link to the source where ever possible and I suggest this is the best way to show credit for sourcing images :) Keep up the Datsun racing man. Hi Christopher. So sorry about the watermark thing. I can work on it and change it all to its original form if you so wish. Thanks for hooking up with me, I hope you liked our pics of the Datsun’s we are racing and that I will see some of ours pics on your site as well. Where are you situated, I need you to send me more pics of sunny trucks. Speak to you soon. Hi Christopher, you’ve snapped some great photos of vintage Japanese cars! I’m a Corolla KE72 owner, nothing fancy though, just a bone stock, close-to-original looking white wagon! i’ve posted on here a few times and love your style but i just a quick datsun tech questions… s13 ca18 brakes + ssr mk2’s 13×7 +-0? have you done this? any clearance issues? thanks for the reply man. im surprised at your opinion on the s13’s! the guys over at datsun1200.com swear by this combo hence why i’m in the process of collecting bits and pieces. what do you run instead out of curiosity? Yeah but that’s because most of them run 14s, 15s and generally just skinny and boring wheels. If it’s just a street car, a well serviced (with decent pads) B110 coupe or 120Y disk brake set up are adequate (and even for drifting as you don’t require much heaving braking as I’ve found). If you’re after something for the track then why are you considering heavy, poorly performing factory brakes? Get into some Wilwoods and match them with some factory disks. You’re still going to have to make an adapter for the calipers for the S13 brakes so may as well build a light, well performing set up that is still going to be worth something later on. They aren’t even really expensive in my opinion!